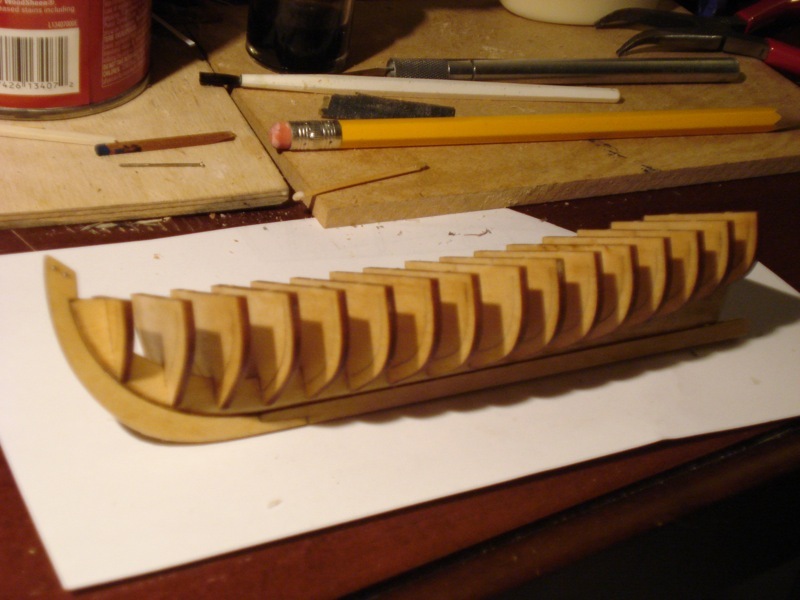 This project is based on the Model Shipways’ 18th Century English Longboat kit. I’m building this one straight from the kit with very little modifications except for the way I did the friezes and replacing the kit blocks with nicer aftermarket ones. There is a small amount of metal work required with this kit. 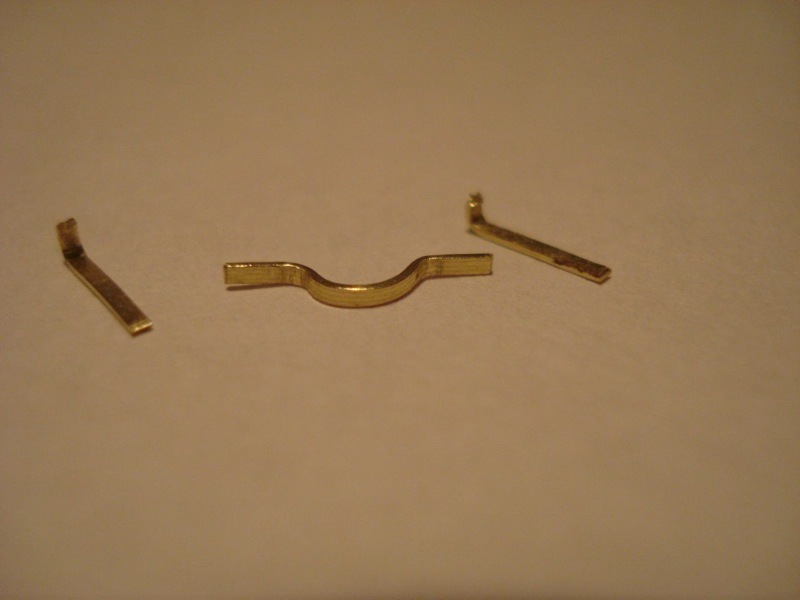 Model Shipways provides a plentiful supply of brass wire, steel wire and brass flat strip. 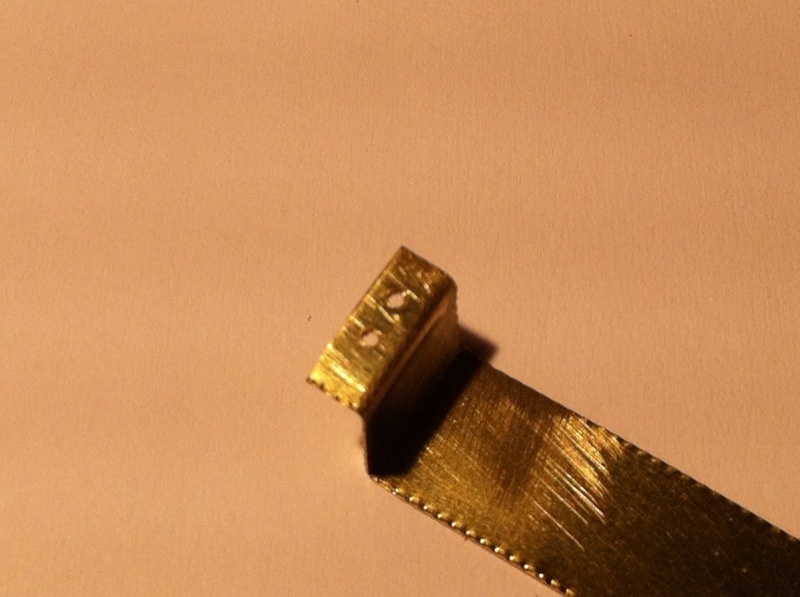 For the deadeye stropping mast bands, the instructions call for simple use of CA glue. I chose to silver solder these assemblies since I’ve finally been successful at making good silver solder joints. Most of the brass, I’ve blackened using a brass blackening solution I purchased from Bluejacket Shipcrafters. This stuff has worked better for me than the more readily available stuff called “Blacken-It”. I then coated the blackened metal with satin polyurethane finish. In some cases, I’ve had to touch this up with a little black paint. The thole pins are simple wire provided in the kit. In order to create a nice uniform spacing between those pins, I took a piece of brass strip I had on hand and drilled a pair of holes the appropriate separation. I then used this as a guide for drilling the gunwales. I’ve never been very good about making and little jigs like these, but this worked really well. The spars are pretty easy to make. There is a bowsprit, boom, gaff and mast. The small size makes them quick to shape. The mast is probably the most difficult since the upper portion of the mast steps down in size to a pole topmast. Also, the mast require drilling and cutting to simulate 3 sheaves. One is in the thick part of the mast and the other two are in the pole topmast. This requires a lot of care to keep from snapping the mast. In fact, I managed to snap the mast right at the middle sheave, but repaired it. The repair held, even after adding all the halliards and stays, and the break cleaned up well and wasn’t noticeable. For the blocks, I used some swiss pear blocks that I bought from Chuck Passaro’s Syren Ship Model Company. 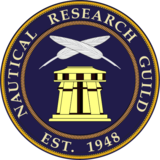 Chuck Passaro, as you may recall, is the designer of this and four other kits for Model Shipways. The blocks are excellent – just about the best you can buy. I was actually surprised at how much rigging there is on this tiny model and how long it took to do all the rigging. It took some extra care to deal with it since the model is so small and relatively delicate. I ended up using some rigging line I had on hand instead of the stuff provided in the kit, but for no particular reason. I managed to lose one of the belaying pins in the kit and this was one of the very few things for which Model Expo didn’t include extras. I wrote to their parts department for a couple spares and they sent me a bag of something like 20. However, in the week or so that I was waiting, I found some Amati belaying pins I had that worked fine. The final step was to sand down the oars which come laser cut from sheet stock. It took a bit of sanding and I actually started by using a knife to whittle down the edges of the oar handles and thin down the ends of the oar blades. I chose not to add the grappling anchor in the kit because the casting seemed a bit large for the model. Photos of the prototype show an anchor that is considerably smaller and looks good. Anyway, I can always add the anchor back on later if it seems like it’s missing. I made the base from a sheet of cherry that I cut to size and shaped the edges on my router table. 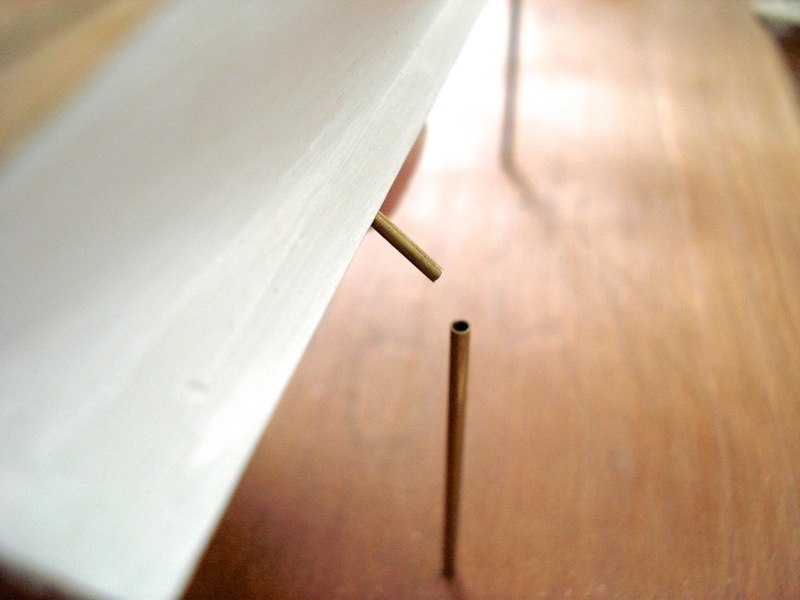 The posts that hold the model up are actually brass tubes with brass rods inside that stop short of the top. 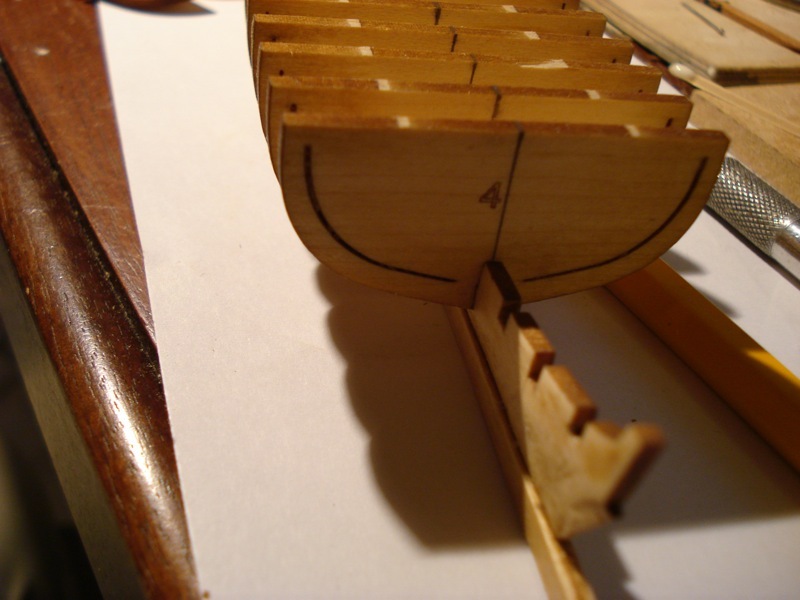 I then inserted small brass rods in the keel of the model which would fit into these tubes. This entry was posted in 18th Century Longboat Build, Ship Model Build Logs, Ship Modeling News and tagged 18th Century English Longboat, Longboat, Model Shipways, Ship Model Kit, Ship's Boat on November 14, 2013 by catopower. Planking this model was the hardest part of the build. The first couple are very straight forward and don’t require any special tapering, and bending them is very straight forward. After that, the planks require some edge bending and with thin basswood, that’s a bit tricky. The next planks are the garboards, which are the planks next to the keel. Following the instructions in the kit, I was able to manage tapering and edge bending. That took some soaking and heat, but it worked. These are then bent normally before gluing into place. 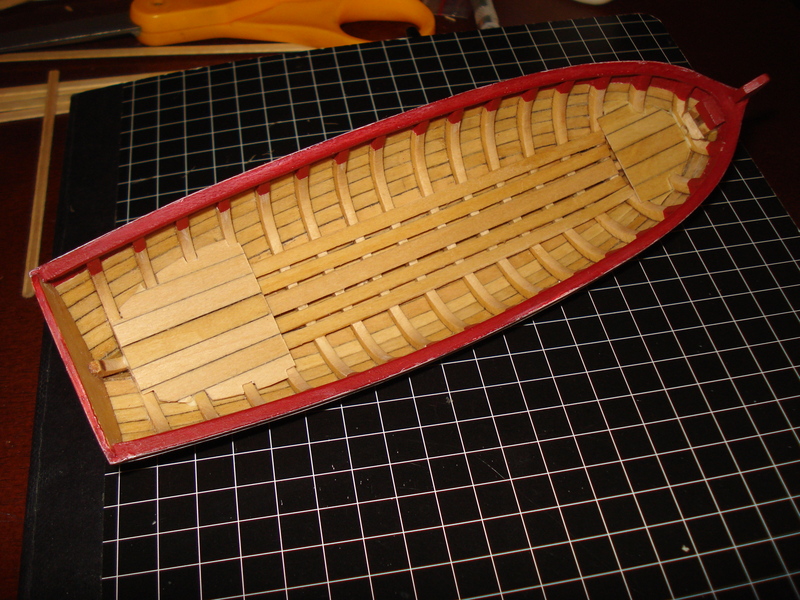 It all worked pretty well, but the boat almost looked clinker-built since I couldn’t do enough edge bending. Sanding took care of it, but the planks required so much of it that you could see light through them when all was done. I did have a little trouble with one of the planks at the bow, but it shouldn’t stand out too much once the hull is painted. Note that the planks are edged with a No.2 pencil before gluing into place. The bulkheads are then cut loose, leaving the frames in place. With the planking done the hull is fairly strong. It still requires some care, but it’s sturdy enough to work with. Frames are sanded way down. Floor boards and platforms are added and hull painting is started. Note that I followed the kit’s recommendation and stained the hull with a 50/50 mix of Minwax Golden Oak Stain and Natural Stain. For the paint, I used a mix of acrylics. The red interior is a mix using Tamiya acrylic paints – the first time I’d ever used them. I chose a dark red color, which might not be very accurate since contemporary models seemed to use a much brighter shade of red. Risers are added along with other internal detail. The instructions explain a method for simulating edge molding by simple use of a scribing tool and straightedge. It took a little practice to get the scribed line nice and close to the edge, but I was really happy with the results and impressed with the simple technique. The frieze design was provided in the kit as color printed paper. These turned out to be oversized for the model, but the models developer, Chuck Passaro, provided the artwork as a pdf file. I printed this onto decal paper and applied those to my model. To get them to fit properly, I still had to re-scale them down by about 3% or so. More details of this build in a future post. 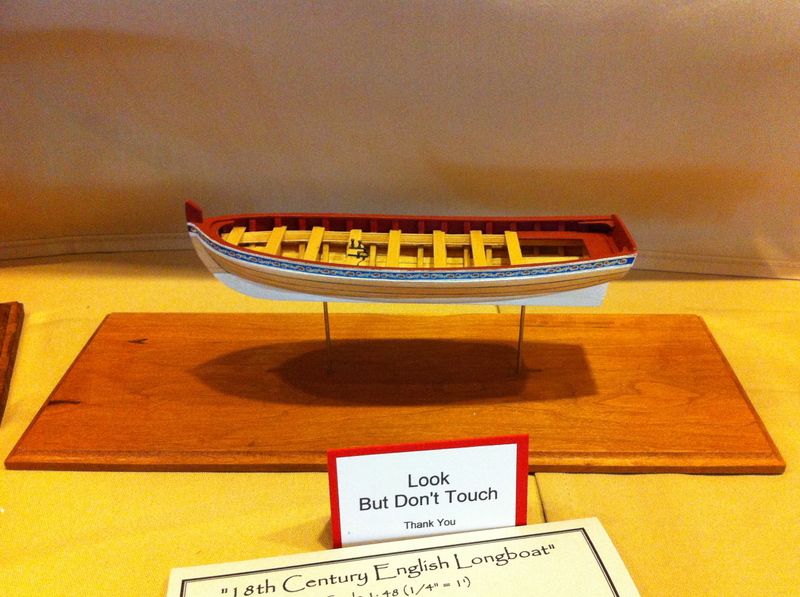 This entry was posted in 18th Century Longboat Build, Ship Model Build Logs, Ship Modeling News and tagged 18th Century English Longboat, Longboat, Model Shipways, Ship Model Kit, Ship's Boat on November 11, 2013 by catopower. Looking back to the beginning of this build, the framing of this kit is pretty easy to put together. The hard part is the planking that comes later. At this stage, however, it’s pretty much a matter of fitting the nicely laser cut frames and keel. The kit use bulkheads which are specially designed so that after planking, the centers of the bulkheads are easily removed, leaving just the portion that act as open frames. These are then sanded thin to match the appearance of real frames. Some people have opted to upgrade their kits using boxwood from Hobbymill. I remember Chuck Passaro commenting many times in his blogs that making the model with basswood would result in something just as good as boxwood, or something to that effect. I didn’t really buy that at the time, but I have to say, I’m really happy with how things turned out using basswood. I followed the suggestions in the instructions to stain the wood with a 50/50 mix of Golden Oak and Natural stains using Minwax stains. I also pretreated the wood with Minwax’s Pre-Stain Conditioner. After carving the rabbet and assembling the keel, I marked the centerlines of all of the frames to assure good alignment when assembled. Test fitting the frames went very easily and it wasn’t long before I could begin the planking. As you can see from the pencil and other items in the background, this is not a very big model. Next step was to add the first planks at the gunwale to hold everything in alignment, then going back to the keel and adding the garboard plank. I’ll post some photos of that next time. 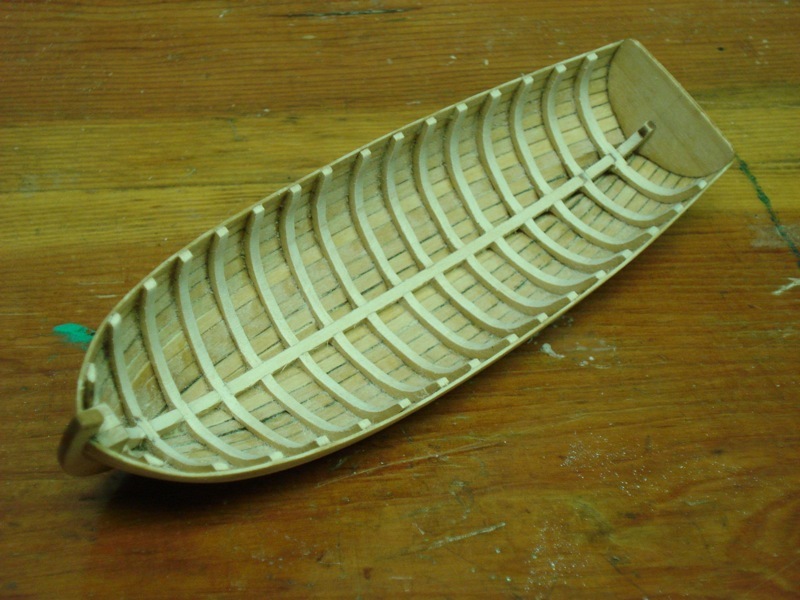 This entry was posted in 18th Century Longboat Build, Ship Model Build Logs, Ship Modeling News and tagged 18th Century English Longboat, Model Shipways, Ship Model, Ship Model Kit, Ship's Boat on November 1, 2013 by catopower. 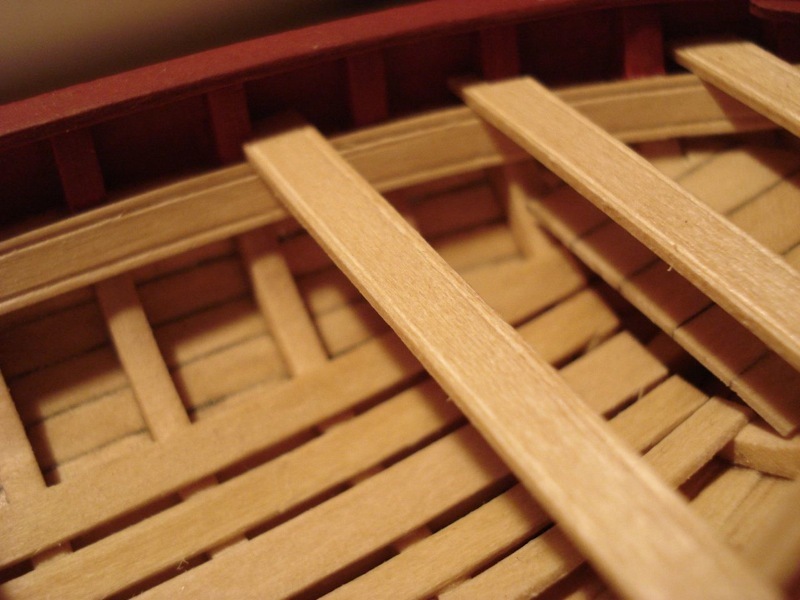 Before I get into the construction of my longboat model, I’d like to talk a little about the kit itself. The kit was designed by master modeler Chuck Passaro, who has designed I believe four other kits for the ship model kit manufacturer Model Shipways. Photo of Chuck Passaro’s prototype model. 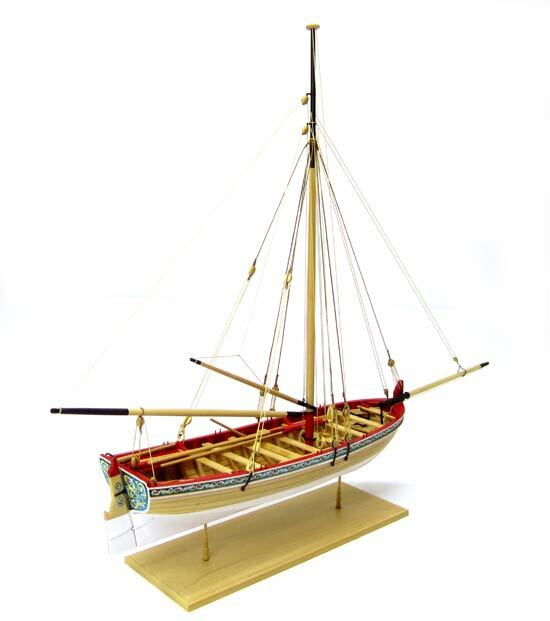 The 18th Century English Longboat kit is a very tiny model of an open boat – the type of boat that would have been carried aboard large sailing ships of the period. 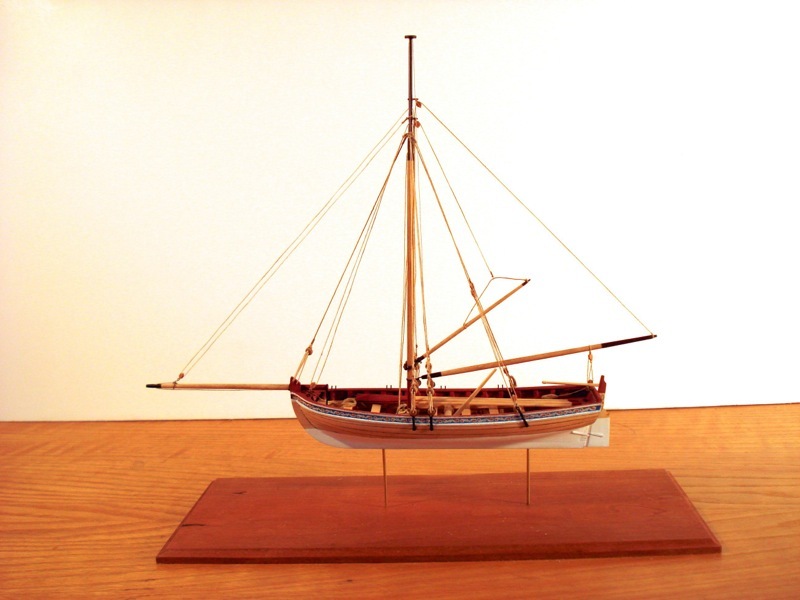 The model is of a 26 foot long boat circa 1750-1760 and is based on contemporary models found in England’s National Maritime Museum. 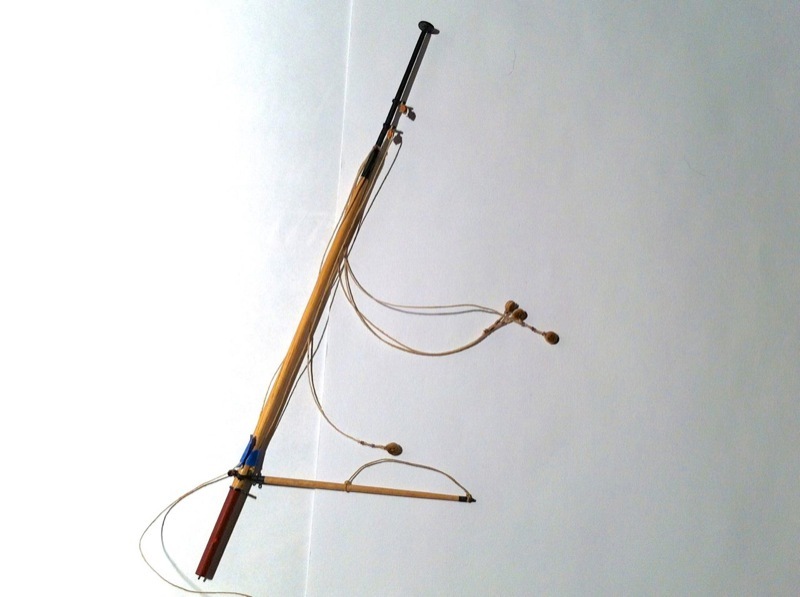 Fully rigged and at a scale of 1/4″ = 1′, the model is just under 12″ long and 9″ high. The hull itself is only a tad over 6-1/2″ long. At this size, it is not a beginner’s model. I would say it’s best as a model built by an intermediate or advanced modeler who wants a small project to work on, maybe as a distraction from large sailing ship models. That doesn’t mean that a determined beginner can’t build it. It’s just that I think a larger model will probably give a beginner better results. Construction of the kit is all basswood with laser cut frames and other major parts. Plenty of extra wood, wire and brass strip is provided in the kit, so there is a lot of room for errors with plenty of stuff to spare. The only thing that I found a rather bare minimum is that there are four very tiny belaying pins and all of them are needed, so don’t lose one. Of course, if you do, Model Expo is good about replacing them. The instructions are great. Model Shipways has a tendency to change their printed formats over time, but when I got mine, the book was 19 pages and printed in color. I don’t know if the current version is in color, but the downloadable pdf version available from their website is only black and white. There are a couple sheets of plans in the kit, one of them in color. 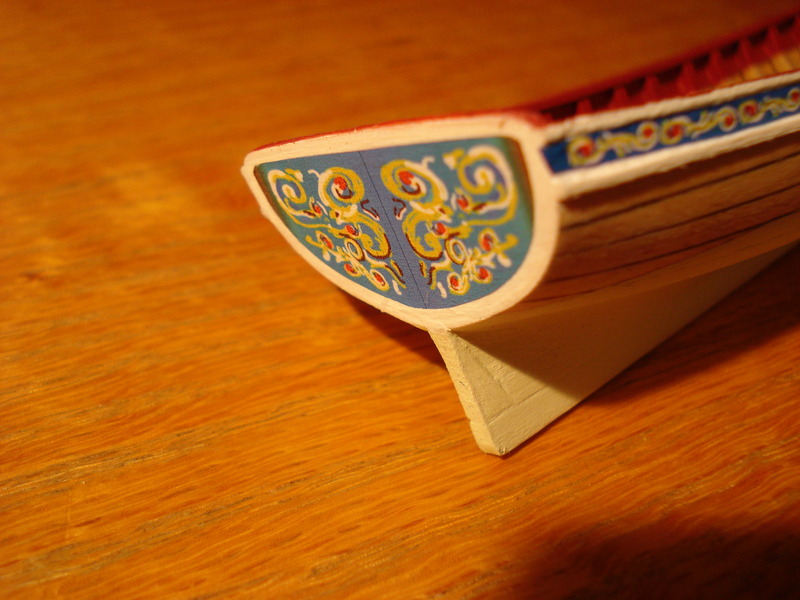 The boat’s decorative friezes are simulated with the use of color printed paper that you cut to fit the model. The one issue I ran into is that the printed artwork was too big for the model. Perhaps this has been fixed since the initial kits went out, but mine and others I know were off by 10% or so. But, fortunately, the kit designer, Chuck Passaro, was ready to assist on the website Model Ship World where he is an administrator. He can be found there and has posted downloadable pdf versions of the artwork that you can resize and print on your own printer. The most difficult part of construction is the planking. 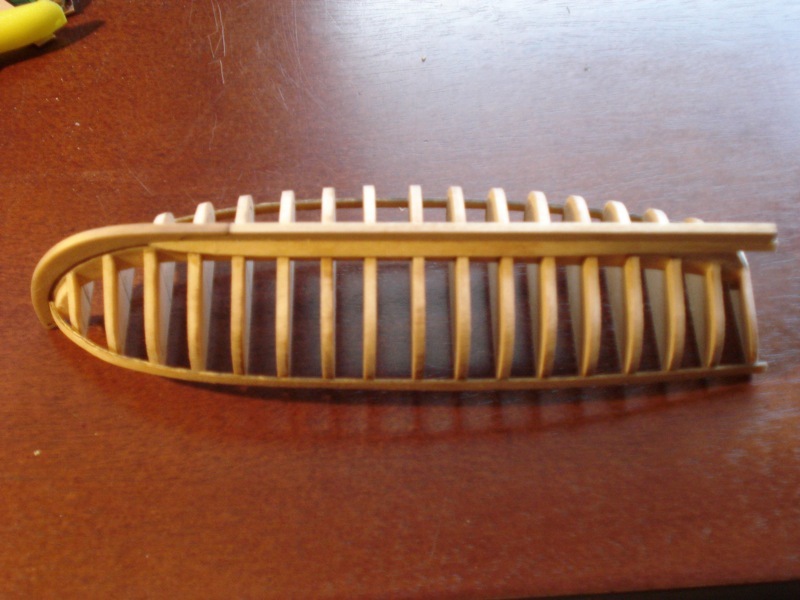 The planks are thin 1/32″ basswood that has to be bent as well as edge-bent to fit into place. 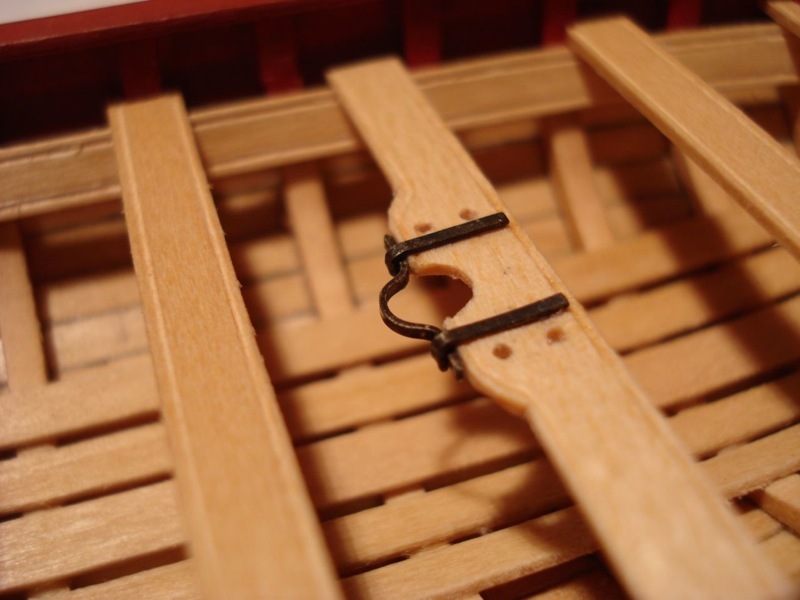 That’s not easy with basswood this thin as it has a tendency to kink and buckle. The wood requires soaking, heating and lots of patience to fit. Then, working with the masting and rigging on a model this small takes a steady hand and more patience. This entry was posted in 18th Century Longboat Build, Kit Reviews, Product Review, Ship Model Build Logs, Ship Modeling News and tagged Longboat, Model Expo, Ship Model Kit on October 30, 2013 by catopower. With all the projects I work on, progress in any one of them can be a bit slow. Every now and then I start to get antsy to finish something. 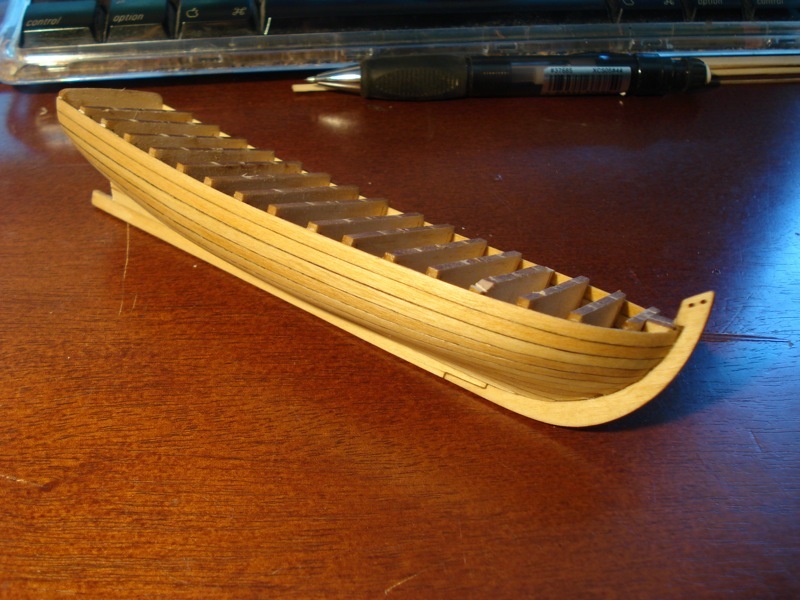 This is one of those times, so I decided to finish up my 18th Century English Longboat. I’ve had this small 1:48-scale model (1/4″=1′) project since about January of 2012. Though I’ve primarily worked on scratch projects over the last few years, I decided to pick up the kit as something straight forward to build, something that didn’t require lots of research or decision making – just something to work on when I didn’t feel like working on something else. Over the course of almost two years I worked on the model here and there and pretty well finished up the hull. After the recent ship model display at the Good Sam Showcase of Miniatures, where the model was displayed “in progress”, I decided the model was close enough to being done that I would go into high gear on it and finish it up. I hope to finish it up in the next week or two and will post more about it as I go. 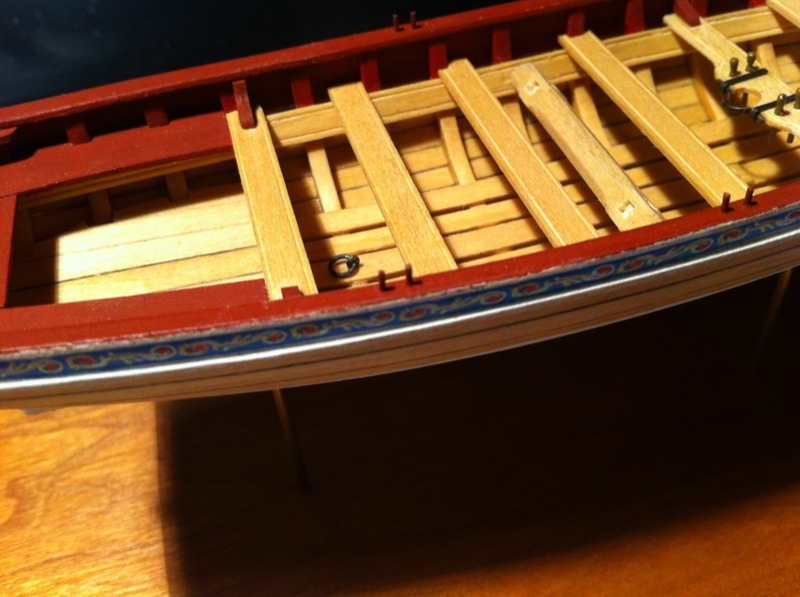 This entry was posted in 18th Century Longboat Build, Ship Model Build Logs, Ship Modeling News and tagged 18th Century English Longboat, Longboat, Model Shipways, Plank on Frame, Ship Model, Ship Model Kit, Ship's Boat on October 22, 2013 by catopower.